America’s First National Seashore, Cape Hatteras N.S. is 67 miles long and includes Bodie Island, Hatteras Iskland, and Ocracoke Island. The area is gorgeous and minimally developed, with miles along the beach, trails through woods and salt marshes, and a lovely jaunt up to the Cape Hatteras Lighthouse. The highlight of running is along the nearly continuous beach, which can be gorgeous for running. State Highway 12 is the main road through the Park. There is a reasonable shoulder for running, but not that many water views– it’s mainly running along open, scrub/dune terrain. Quite exposed. Beach. 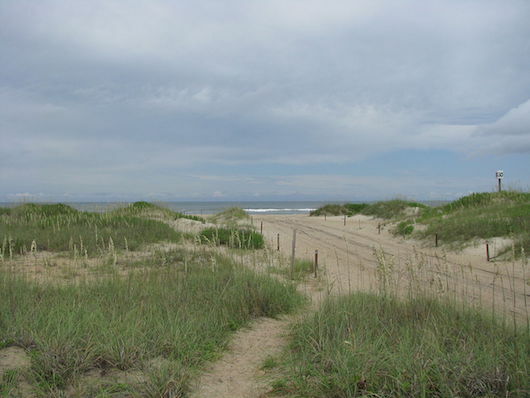 There are 70 miles of beach, with numerous access points and parking lots. Best running is near the water line, where the sand is firmest, most predictable around low tide. Tide Table. Running closer to the dunes is more challenging.Note there might be ATVs and some sections might be occasionally closed. Trails. There are some trails that are good for running on Hatteras Island. The most extensive is the Open Ponds Trail, 4.5 miles through dunes, shrub thickets, and maritime forests of Hatteras Island as it winds its way between British Cemetery near the Buxton Woods Picnic Area and Trailhead and the Frisco Campground. Another option in the area is the Buxton Woods Trail, a level trail for 3/4 mile each way, starting at the Buxton Woods Picnic Area. Lighthouse Run. In the Buxton/Hatteras Island area, a good run is along Lighthouse Rd.,up to the Cape Hatteras Lighthouse. It’s about 3 miles one-way from Highway 12 to the old lighthouse site, then the new one, to the entrance to Cape Point Campground. Ocracoke Island. We’ve mapped a nice loop around this island at the southern tip of the National Seashore. Includes the Lighthouse, Visitor Center, Preservation Society…and Slushy Stand! MAP. Full description.